History – The Nerveless Nocks Entertainment Productions producing Thrill, Stunt and Circus productions world wide since 1840. Their circus and entertainment roots date back to the early 1700s and were legally established as Switzerland’s first circus in the year of 1840, legally acknowledged by the Swiss government. The Nock family has produced the finest live circus and thrill shows for over 9 generations. The Original Nocks performed for Queen Elizabeth in 1954 as a command performance in London, England and after their performance for the Queen she named them Nerveless and the name was created. 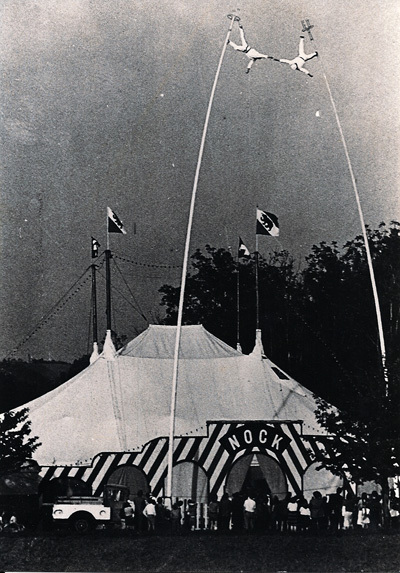 The original Nerveless Nocks consisted of Charles Nock, Dorothy Nock, Eugene Nock SR, Elizabeth Bauer Nock and Joseph Bauer first performed in the United States in 1954 headlining the Greatest Show on Earth for then Circus owners John and Henry Ringling North. The Nerveless Nocks headlined the show for the next four consecutive years with their Sway Pole extravaganza and also performing The Aerial Balancing Ladder. In 1956, Eugene Nock Sr. married circus great Aurelia Canestrelli while performing on the Greatest Show on Earth. The Nerveless Nocks then went on to perform on The Ed Sullivan Show on February 9th 1964, the same episode as the Beatles. They also performed alongside the great Mitzi Gaynor and Davie Jones from the Monkees, and in The New York World’s Fair, The Montreal Exhibition, Walt Disney’s Disney on Parade and Peter Pan World Wide Touring Shows, headlining all the greatest Circuses and State Fairs worldwide. In 1977, Dave Merifield, of Helicopter Trapeze fame, recommended The Nerveless Nocks, consisting of Eugene Nocks Sr., Aurelia Canestrelli Nock and their sons Eugene Nock Jr., John Nock, Michelangelo Nock and Bello Nock to Tommy Bartlett and Tom Diehl, the water ski show pioneers, of The Tommy Bartlett Show in Wisconsin Dells, Wisconsin to perform at their outdoor spectacular shows. 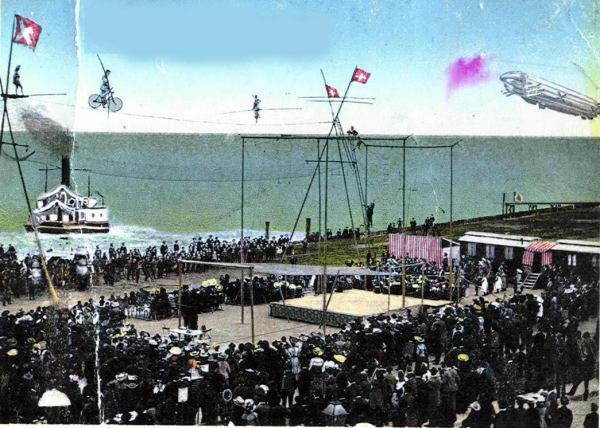 The Nocks have been performing a record 37 consecutive years, where they performed their Sway Pole Act, Space Wheel, Helicopter Trapeze, Motorcycle High Wire, Carolina Espana Nocks Contortions and The Globe of Thunder Acts. The Nock children, Eugene Nock Jr., John Nock, Michelangelo Nock and Bello Nock The Clown, were taught every aspect of entertainment from their talented parents, Eugene and Aurelia, and their Uncle Pio Nock, The Original Comic Daredevil, who headlined in the motion picture Circus World with John Wayne in 1969 and headlined his comic Daredevil acts on The Greatest Show On Earth for several years. They taught them stunts, gymnastics, ballet, clowning and aerial acrobatics. Over the past 35 years, The Nerveless Nocks revolutionized the touring of the World Wide All-American Thrill and Stunt Circus Production. They performed around the world in countries such as Thailand, South Africa, Australia, New Zealand and China, bringing to the world audience large scale Thrill and Stunt Show Spectaculars for the first time in history. The Nerveless Nocks also have produced their brand of Daredevil Shows at many major amusement parks such as Six Flags, Disney Land, Disney World, Universal Studios and Sea World. The Nerveless Nocks also produced many NFL Super Bowl Half Time events and major Super Bowl parties for Maxim Magazine and The Home Shopping Network. 1994 video footage of The Nerveless Nocks at The Tommy Bartlett Show WI Dells featuring Carolina Espana Nock and Michelangelo Nock owners of The Nerveless Nocks Inc. The current members of the Nerveless Nocks consist of Michelangelo Nock, Carolina Espana Nock, Angelina Nock and Cyrus Nock. Carolina Espana Nock is a highly talented flying trapeze artist, The Flying Espanas and Daredevil Artist. Her circus roots date back 100 years and 5 generation as one of Mexico’s and the world’s greatest Circus families. Carolina performs on the giant Sway Poles, the only woman to ever perform on the doable giant Space Wheel, Flying Trapeze and numerous daredevil stunts. Angelina Nock is one of the most talented live female stunt performers in the stunt industry today. Angelina is a 9th generation member of the Nock family; she excels on The Sway Poles, world class water skiing and aerial stunts. Cyrus Nock has been performing and touring the world since the age of 4 and is now the top motorcycle stunt man of his generation. Currently The Nerveless Nocks produce live action stunt shows, Circus Spectaculars, Motor Sports Entertainment Spectaculars, and Big Top Productions, large scale sporting events, concerts and music festivals for the biggest names in the industry. The Nerveless Nocks Entertainment Company is now celebrating our 173rd year producing family entertainment.